Oops, forgot to post this on Monday, thankfully there is backdating on Blogger! F&B had no ideas what they wanted for lunch besides eggs, so eggs it was. To make life easier on me, they both got the exact same rest of the lunch. 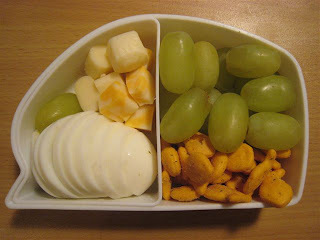 Both kids have a sliced boiled egg, cheese cubes, ranch Goldfish and grapes. 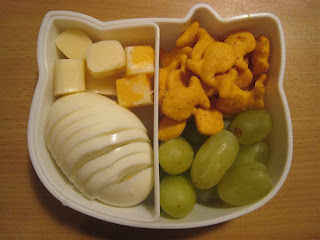 Faith also added a yogurt for snack and a fruit jelly for hers. Ben gets snack through his school.